This video provides a quick introduction to what you can expect from this video series, explaining the rationale for the organization of information presented, how to get the most out of the videos, and an overview of the project. The videos are done in c# but we do have all the source code examples in both c# and VB.Net. Use the links on the right side to navigate forward through the series! If I subscribe to this series, I only get the most recent 25 episodes, so I don't get the intro videos. Any ideas why? Looks like there are 63 total, but only 25 show when I subscribe to the RSS feed. @MontanaIrish: I'm betting this is due to the order is flipped. We'll be correcting that shortly. I'll raise the RSS issue but I believe that is due to how I released the series, all in one big burst. I was a little surprised to not find this series listed under the 'Learn' section. What's the thinking there? Is there a way of downloading the series in order so I can place it on the school file server? As they are they do not seem to be in any kind of order. 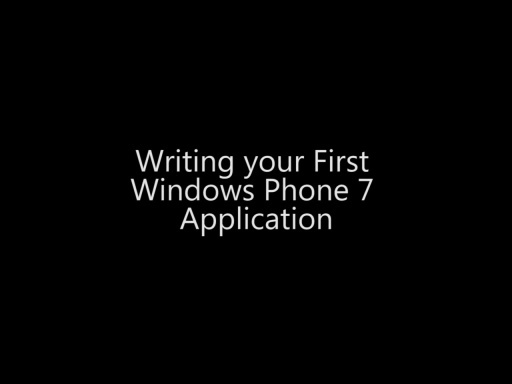 I want to teach Win 7 Phone programming as the core of my Programming 4 course next semester and these sure would make life simple. Yeah, not being in order is kind of rediculous -- at least include the step# on within the title! I listed all the videos in the correct order (I believe) here for a quick-and-dirty list. @dm3281: something I want to do but something needs to be fixed before I can actually do just that. lol, I need SILVERLIGHT to watch this?! LAWL!!! I'm a developer on Linux, for years now, and I just wanted to get a sneak peak of your presentation, and you're telling me I need SILVERLIGHT?!!?! @dootzky: @Ben B: if you download the videos (right next to the video) you don't need silverlight then. You only need silverlight to view the videos in the browser. @blake tallos: most videos here are under 5 minutes in length. This series was designed for someone that is new to developing software. @Rachida Dukes: I just appended on day / part to each part. Do you have a better suggestion on ordering? Helpful suggestions are always welcome. The RSS feeds are still messed up. All 63 should appear but they don't. May I suggest you scrap the entire feed and remake it and put the lessons on a new feed in the correct order. Maybe there is an easiler way...Not sure..My Zune only sees the last 20 or so. Could these be made available in the Zune Marketplace as a Podcast? That seems to be the easiest way for me to subscribe to these videos. Are there any other tricks to getting them automatically downloaded to my Zune? Thanks! Are you guys aware that your Silverlight video's always crash at least in my in Firefox 3.6 browser the moment you want to watch them fullscreen? The Firefox browser totally freezes up when the Silverlight warning message pops up. Very nice series! I'm about 2/3 of the way through and thoroughly enjoying it. Well Done! @rolf siebelink: I built in a workaround in the player to prevent the crash issue on FF 3.6. The update will happen on the next update to ch9. Work around would be to open up IE and accept the full screen pinning permission on Channel9. If you do that, you won't hit this issue. HOW CAN WINDOWS PHONE 7 INTERACT WITH AN ASP.NET MVC WEBSITE? Hi I would really like to know how I can make Windows Phone 7 play with an ASP.NET MVC website. I would suggest that some MS person or a geek would give us some examples of how to write an WP7 application or WP7 web client that interact with an ASP.NET MVC website. I am very interested if anybody has further references about these matters: How WP7 can interact with an ASP.NET MVC website, so please let us know if you know anything! I am unable watch the video's. An error message "Media Failure. Try reloading the page or visit the main site for assistance". Is this a problem my end? Any help would be appreciated. @Richard I: I just tried and it loaded. Could you retry? I have Visual Studio 2010 Premium. Do I need specifically Express for phone? 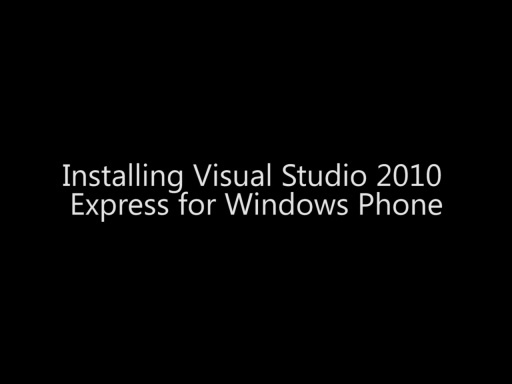 You can download the free tools for Windows Phone 7 development, they will automatically integrate with your Visual Studio 2010. I need do something for this. 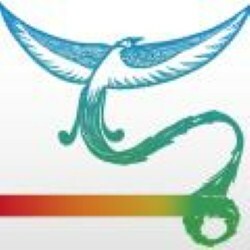 @sbonkov: if your firewall blocks you from downloading videos, chances are it is blocking you from viewing. sorry, not much we can do. As a contractor that never gets to stay in one technology for very long, this looks to be a nice series. Thanks for putting it together. I need to get Microsoft trained and certified this year in order to stay marketable. I thought I'd jump into mobility development. It looks like plenty of people have posted that they have issues with the ordering of the videos. I just posted the feed into my Zune to view it as a podcast and yikes! Some suggestions, adding a date code or episode number to the beginning of each video title would help for ordering them alphabetically, like most software can. Also, a more time consuming method would be to repost all of them in order so they could be sorted by air date like a podcast. Since it appears most of the vidoes were posted on the same day, putting them in order with Zune definitely doesn't work. Hmm, you know what? It seems my Zune has been able to sort them all out after all. Disregard my comment before then. But the naming convention would be good still. I find when downloading a tv series or something that the following naming scheme works good. "Series_Title_S01E01-Episode_Title" Where S01 is the season number and E01 is the episode number. Thanks very much for this tutorial series. Is there any place I can go to download the entire series (instead of each video one-by-one)? Very nice series thank you. First of all I am complete noob. I have a WinCE 6.5 based device, I want to know, applications developed for Win 7 Mobile (particularly this tutorial application) will work on that. Thank you verry much channel 9! Exactaly what I needed! This video is not playing in any of the browser in my system neither they are downloaded. Bah. No captions or subtitles. It's useless for deaf programmers. Thanks a lot for these videos, most helpful. Hey, after 3:30 minutes watching the video (with the HTML5 player if that's important) suddenly the audio track started from the beginning WHILE THE VIDEO AND ITS AUDIO CONTINUED PLAYING! This is a major PITA and I would like to ask you to correct this. Thanks for uploading such an informative tutorial. But can you tell me whether I can start building games too with this whole tutorial?